See also Part 2: Frame and Engine, and Part 3: Putting it Together. After my last vacation in southern France I had enough of it. Every year seeing so many Willys Jeeps driving around in the sun was to much to bear for me. It was time for a Jeep of my own. Asking around in France, I learned that there were enough Jeeps available, mostly built by Hotchkiss (see Jeeps in France). But the price was too high according to the state of the vehicles and for my wallet. After coming home from the vacation, it didn't let me go -- I was infected with the Jeep virus. After searching on the Internet I found a few addresses of army surplus dealers here who have Jeeps available. Most af them have only the Dutch-built M38A1 called the "Nekaf". Two others have a Willys MB, which I can't afford. And finally I found one dealer who had a 1956 Willys CJ-3B for a nice price. Originally it was used in Switzerland by the Army there. For me it was the one chance out of hundred -- this one was mine. The engine was in running state (sort of). The rest was in reasonable and complete state including a lot of rust. See a closer photo including the military soft top (50K JPEG). The next weekend I hired a trailer to get the jeep home, a trip of 300km up and down. Coming home, the first thing I did was try to get the engine running properly. Checking out the compression, I learned that the engine internally was OK. However, the power output was too low. Changing the sparkplugs was enough to get most of its power back -- before changing the plugs it was running on only 3 cylinders. The next problem was that the engine wouldn't run without choke. Obviously something was clogged or the accelerator pump was leaking. After tearing apart the carburetor and cleaning it, the full power of the engine was back -- the problem was that the carburetor was clogged with a sort of fine gray clay. Now it was time for a real test drive. Wow!! What power and acceleration for a machine 44 years old. For a few seconds I drove in third gear, almost 90 km/h. Help!! The brakes weren't working. Only the parking brake worked a little. See detail photos of the ID plate (40K JPEG). See also the tire info plate and shifting info plate (all plates in both German and French). I had to decide what to do: repair the brakes and go to the inspection to get Dutch driver's plates, or tear the complete vehicle down and start a restoration. With the winter coming up, I decided on complete restoration. I started the restoration with the body. When the body was off the frame and upside down there was a lot more rust than I suspected. All the channels and the bottom plate were rusted so badly that they needed to be replaced, so I removed them from the underside of the body. See also a photo of the rolling frame (60K JPEG). I tried to remove the paint as much as possible with a chemical paint remover. A dirty job and a lot of headaches from the smell of the paint remover -- I needed over 5 liters to clean the body and the fenders. 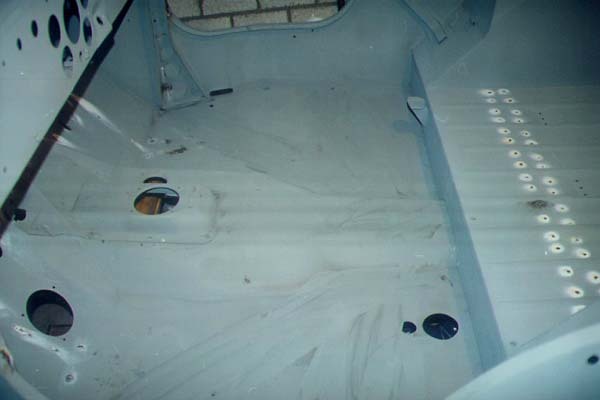 See the inside of the tub with the paint and bottom plate removed (40K JPEG). 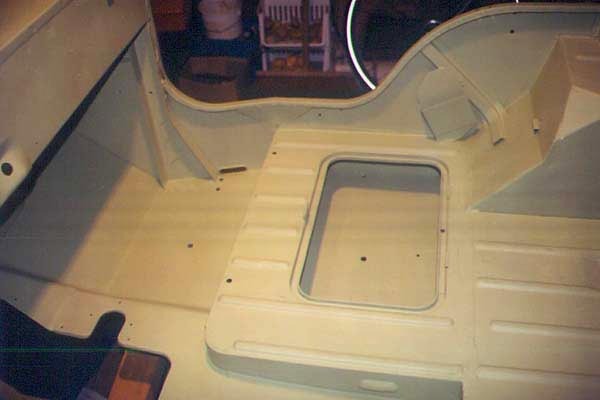 See also the bottom of the tub (60K JPEG) with pieces including the spare tire brace. After sandblasting the complete body and all of its components, the toolbox needed some extra attention as there were some holes and sharp edges. I made new channels to replace the old ones. The bottom plate came from H.O. Wildenberg B.V. in Rhenen, Holland (Tel. +31 (0)317-618218), who have a wide range of spare parts for Willys, much of it from military surplus. They also have complete body tubs in stock. The welding of the bottom plate and channels was a piece of cake after the sandblasting. After sanding the welds I gave the body two coats of a zinc-phosphate primer. At this moment the body is ready for painting. See also the toolbox and inside of the tub in primer (20K JPEG). 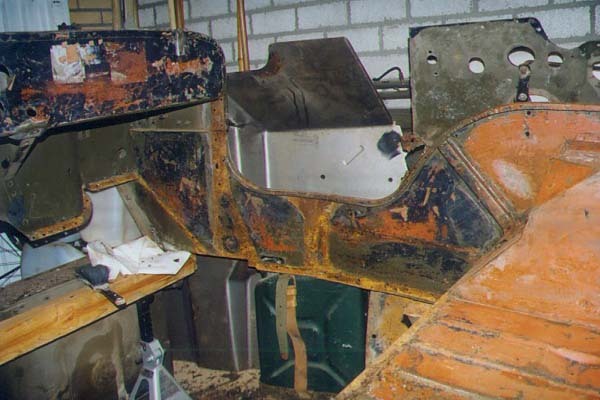 Continue to Part 2: Frame and Engine or see Piet's 2001 CJ-3B Vacation in France. 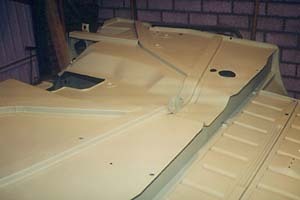 See also more Tech Tips on body rebuilding, and elsewhere on the web, see Body Work on The CJ-3A Page.